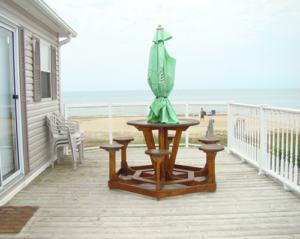 Bearfoot Park Sauble Beach Cottage Rentals | BOOK NOW! We offer executive style beach front and beach view units. 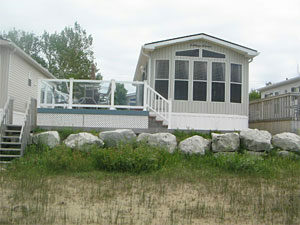 Click on the links above to view our selection of newer cottages in Sauble Beach to rent. All units are discounted in May, June, September and October. Sauble Beach offers 11 km (7 mi) of pristine sandy beach for your enjoyment. Sauble Beach is one of the cleanest fresh water beaches in the world and second largest in Canada. Sauble Beach was voted the best beach in Canda and the best kept secret for beach front family holidays. Because this is in the “featured” category it will appear on the front page. If this wasn’t “featured” this excerpt would not be seen on any other pages. Sandy Sauble Beach right at your door step. Your deck is directly on the beach so that your family may listen to the sound of the water lapping the shore. Directly on the beach. This property has a fabulous deck with gorgeous patio furniture and BBQ. Enjoy the world class sunsets while entertaining your family members. Why wait? A beautiful journey in Sauble Beach awaits you. Do we rent cottages in the winter? Presently we do not rent cottages in the winter. We take bookings all year long and can be easily contacted at chris_bearfoot.cottages@yahoo.ca. The trick is to contact us as soon as you know dates you're looking for so that you can get a reservation first. Note: Long weekends go quick!